The TBWA\ collective was first formed in Paris in 1970 but the large group of international entrepreneurs who joined the group over the next decades would see the brand evolve into the powerhouse it is today. In South Africa, Hunt\Lascaris joined the TBWA\ stable almost thirty years ago, and the group now includes the advertising agencies TBWA\Hunt\Lascaris and OpenCo, strategy and research agency Yellowwood Future Architects, branding and experiential specialists Grid Worldwide, public relations agency Magna Carta Reputation Management Consultants and specialist marketing agency HDI Youth Marketeers. In 2015, TBWA\ launched Project 20\20 as a challenge to increase women in leadership roles across the collective by 20% by the year 2020. 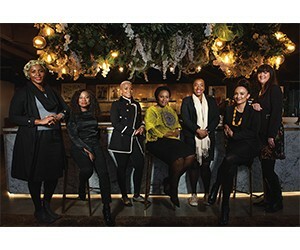 Three years later, the South African collective has made major strides to transform its leadership in the male-dominated industry to ensure it builds a legacy where a new generation of women is thriving. We chat to seven women from TBWA\South Africa about leadership, mentorship and overcoming challenges. In her role, Pantshwa helps clients to connect and find meaningful and creative ways to engage with the youth. “We deliver solutions to the business to help our clients know and be in the hearts and minds of the young people. We are an insight-first business, so we always put youth at the centre of our business and dig deep to make sure that we stay connected,” she says. Her company ensures that they create space for more young women to be in top leadership positions. Pantshwa believes that she’s fortunate to work for a company that strongly believes in elevating women to leadership roles. “Our company has always been predominantly female-first oriented, the current exco team consists of 60% female leaders and as HDI, we are aligned to the TBWA\ vision of growing women in leadership. It’s important for us to ensure we train and develop the next generation of female leaders,” she says. As the MD of OpenCo, Daniels is tasked with all the business management requirements. She’s responsible for managing the day-to-day requirements of a team of 40 employees. She also oversees various client engagements that include experiential marketing and content creation. Daniels is a strong believer in helping those around you if you are a leader. “As women in leadership, we need to support each other, especially the up-and-coming women around us. As someone who has benefited from mentorship, I believe that we have a responsibility to mentor others and provide them with guidance from our experiences and learnings. The beauty of mentorship is that both parties benefit and I’ve found that I’ve learnt from those I’ve mentored as well,” Daniels says. As a young female trailblazer, Daniels believes that the key traits of effective leadership are authenticity and optimism. “I strive to maintain conversations with all team members in an honest and authentic way. I haven’t changed who I am as a leader but rather, I have adapted my leadership style to reflect my somewhat quirky personality. “I also maintain the team’s energy levels by being optimistic, even when the mood doesn’t allow for it. I am always a work in progress and strive to improve on these traits daily, but in true optimistic form, I believe there is always a way,” she says. While she has managed to climb the corporate ladder, her journey has not been short of challenges, but she rose above them. “As a young female in leadership, it is sometimes difficult to be heard and earn your seat at the table. Luckily, I have had great mentors and leaders who have encouraged me to have the confidence to make myself heard and to put myself out there,” she says. “I do believe that we are lucky to work in an industry that is supporting and growing women, and showcasing that equality is non-negotiable,” she elaborates. She adds that while her generation of women has had to fight for equality, the generation that comes after them will face challenges of a personal nature, as we see the continuous struggle for women (and men) to have it all, namely, a great personal life, a successful career and healthy relationships. “This is not always feasible with the demands and pressures of work life, but we are seeing a growing trend for all individuals to want to manage these expectations better,” she says. At her first job, Motsogi was thrown in the deep end by being given her own account. As an intern, for many, this would have been daunting and overwhelming, but she took the opportunity and ran with it. Motsogi says she is grateful that earlier on in her career, she was privileged enough to work with amazing female leaders who pushed her to reach her full potential. This work ethic has stuck with Motsogi and she continues to instil the same in her team. While Motsogi admits that being in the presence of powerful women has helped in moulding her career, it did not come without putting a great effort into her work. “I think it happens a lot where people are very complacent; even very educated people. They sit back and think that things will come to them. You’ll find that a lot of people who’ve reached a certain point of success are the proactive people who get up. It’s easy to give up but it’s all about keeping that spirit of resilience,” she says. As a woman in leadership, she also doesn’t believe in cutting corners. “It’s important that young people understand that you need to build a foundation, there’s a lot of preparation and institutional knowledge that young people can’t just discard. Sometimes we might not be as technologically advanced as they are but there is something important about legacy,” she says. She also advises that young people must take the initiative to find mentors. As a leader, Motsogi says she wants her legacy to be one that focuses on leaving a strong workforce behind and being progressive in her approach. It’s about sharing knowledge and giving people the tools to run on their own. It can be difficult to have humility when you are in a powerful position but Molekoa believes in leading by example. “For me, leadership is about leading by example. I really believe in being a title-less leader, as I’ve grown to be comfortable in my own skin. Coming to work and doing what I do doesn’t define me. I’m a multifaceted and dynamic woman who can’t be defined by one single role,” she says. Her advice to a generation of young women is understanding your purpose and the fact that you need to put in the work and time to develop yourself. She adds that as a leader, it is your role to ensure that people have access to you so they can learn from you. Molekoa says it has taken her over a decade to get to where she is and part of that time has been learning and observing what makes successful leaders. “It’s important to have a personal plan with attainable goals and put in the work to achieve those goals. We live in a world of instant gratification, where we don’t want to put in the hard work,” she says, adding that it’s important for young people to give themselves time to be refined and developed in order to deliver on expectations. “You must have the patience to ground yourself and to excel in your chosen area. We are so quick to want to jump to the next stage, to a point where we miss out on the important life lessons that are meant to help us to be better,” she says. Chivizhe, Group CFO of TBWA\South Africa, is a strong believer in fighting for what you want, rather than waiting for it to be handed to you. Taking ownership of your own destiny is something that Chivizhe is familiar with. “If you have a plan to say, ‘This is where I want to be’, go around and look for the things that will help you get there. In order to grow in any industry, one needs to have a good attitude,” she says. Like many of her colleagues, Chivizhe has been fortunate to have people who took the time to mentor and coach her. She would like to see more females in top positions in the advertising industry and she believes that it is important to also learn to take criticism. “Take the negative with a bit of the positive. If I’m being given negative feedback, what do I learn from it that can help me grow?” she says. As a leader, Chivizhe strives to be seen as a fair leader. “I want to be known as being fair, whether or not you like the decision I make, I must be fair and consistent in that fairness. I instil that in the people I lead. You are in leadership not to win a popularity contest. Some decisions are going to be good and others will be bad but as long as you are fair, people will understand,” she says. One of the key traits of good leadership is being able to nurture and create a conducive environment for your team to thrive. Maluleke, who recently completed her MBA, was recently appointed to the Managing Director role at Yellowwood, an achievement she holds as one of the highlights of her career. In her role, she is responsible for driving strategy and the performance of the business. “I’m actively consulting on projects and providing strategic guidance to the team and our clients. This involves considering the future needs of the business and organising resources to address them,” she says. Although there have been great strides to create an environment for more women to lead organisations, that number is still quite insignificant, compared to the number of males that hold top positions. Maluleke is fortunate to lead an organisation where the majority of top executives are female. She believes that there is room for more females to break through the glass ceiling. However, this will only be possible if organisations create a culture that is female inclusive. “If women are not attracted to your organisation or, more importantly, do not stay, you need to ask yourself some difficult questions about the culture of your organisation. Check your prejudice at the door. We all have these fixed constructs around gender that have been built over time,” she says. “When women are ambitious go-getters, they are often pilloried as hyper-aggressive, while those who are nurturers are seen as not fit for the corporate environment. There is no one way to be a successful leader and assumptions made on stereotypes only inhibit diversity, which has been statistically proven to drive results,” she says. Maluleke also believes that organisations need to create an environment that is welcoming to women and makes them feel valued. “If there is only one woman in your organisation, it is incredibly difficult to recruit and retain more. The more you have, the easier it becomes to attract and keep,” she says. While some companies are still struggling to get this right, Yellowwood takes pride in creating an environment where women can thrive. “Yellowwood is 69% female and our leadership team is 66% female. We have a very clear development plan for everyone in the business and a pipeline of incredibly strong female talent. It is hugely important. We have a very active mentorship programme to drive the success of our people and by extension, our business,” she says. The Deputy MD for TBWA\Hunt\Lascaris Durban was born and raised in Durban. Thomason-Jones studied marketing and moved to the UK, where she spent 10 years working for various agencies. During her time in the UK, she worked across a number of brands.In 2013, she moved back to South Africa and started working for an agency in Cape Town. She was later offered a position at TBWA\ and in December, she was promoted to Deputy Managing Director. Having worked in the UK for a decade, Thomason-Jones says she experienced a culture shock when she moved back to the country. “In the UK, the impact of the colour of your skin or gender is very different, so it was quite a big challenge when I came back to South Africa,” she says, which inspired her to work ten times harder in order to prove herself. “I believe that women are absolute multitaskers, as they can juggle work and a family, and that is the strength of a woman. We are very flexible in terms of working hours for women in the workplace and we offer great maternity packages,” she says. Women are often judged as being emotional beings but she believes women should not be afraid to make their voices heard. Her advice to young women who are trying to crack it in any industry is to learn from those who have come before them. Looking at the trailblazers at TBWA\South Africa, it is safe to say that the future of women in the ideas, communications and experiences business is in good hands, as they have set the pace for many others who will come after them.